Eve is a 32-year-old HIV-positive client in a hospital outpatient clinic. She is referred to Gordon, the social worker, because of non-adherence to her retroviral medication regimen. Imperfect adherence to retroviral medication is a critical problem; it increases an individual’s viral load, leads to drug resistance, and makes it more likely that a patient will infect others with HIV; therefore it may be discontinued if a patient cannot achieve near-perfect adherence to the regimen (Cox, 2009). Eve lives with a partner of 7 years (Joe) and their 7-year-old daughter (Susan), who are not HIV-positive. Eve has a Bachelor of Fine Arts degree in music and works occasionally playing piano in restaurants or bars. She would like to work more, but her illness makes it hard for her to do so. The family struggles with finances, and Eve and Susan are on Medicaid. Eve experiences a great deal of stress and has no social support except her partner and daughter. Eve also states that her side effects interfere with her ability to work and to care for her daughter. In this chapter we discuss why it is important to measure your clients’ outcomes, monitor them consistently throughout intervention, and modify your intervention if necessary. We begin by presenting evidence demonstrating that even interventions with considerable research evidence of effectiveness are not effective for everyone, in part because they are based on group data with clients who are typically not like our clients. In particular, few evidence-based interventions have been tested extensively with clients of color, gay and lesbian clients, and other minorities. Indeed, evidence-based interventions are not available for every problem-client combination. We also discuss research showing that despite widespread confidence to the contrary, social workers and other practitioners cannot accurately perceive their clients’ progress toward achieving their goals, in part due to inherent biases. We also explore the ways clinical decision-making is guided by monitoring clients’ outcomes, even when we are unaware that it is happening. 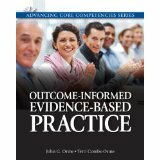 In this chapter we also discuss the contribution of outcome-informed practice methods to enhancing the client-worker relationship, enhancement of the skills of the practitioner, and the ever more critical issue of accountability. Finally, we discuss ethics and the primacy of achievement of clients’ goals as discussed in the National Association of Social Workers’ Code of Ethics.